This article is about cities in internationally recognized Moroccan territory. For cities in the Southern Provinces, see List of cities in Western Sahara. The basic unit of local government in Morocco is the commune. At the time of the 2014 population census, Morocco was divided into 1538 communes, 256 of which were classified as urban and also called municipalities. The remaining 1282 communes were classified as rural. Urban centres were defined by the High Commission for Planning for some rural communes. The following list includes all Moroccan municipalities with 50,000 or more inhabitants according to the 2014 census,[a] as well as one urban centre of a rural commune whose population also exceeds 50,000 inhabitants. In its 2014 census report, the High Commission for Planning also published a list of the legal populations of seven major Moroccan cities, some of which comprise more than one administrative unit. Those legal population figures are incorporated into the list, and the city definitions they are based upon are provided in the notes. Royal Palace in Fes, the second largest city in Morocco and one of the country's "Imperial Cities"
^ Except Ouislane, which is legally defined as part of the city of Meknes: see note g.
^ In the 2014 census, the High Commission for Planning gave the legal population of Casablanca as 3,359,818, which corresponds to the population of Casablanca Prefecture. ^ In the 2014 census, the High Commission for Planning gave the legal population of Fez as 1,112,072, which corresponds to the combined population of those parts of Fez Prefecture not within the cercle of Fez Banlieue ("suburbs"). ^ In the 2014 census, the High Commission for Planning gave the legal population of Tangier as 947,952, which corresponds to the combined population of the four arrondissements of Bni Makada, Charf-Mghogha, Charf-Souani and Tanger-Médina. ^ In the 2014 census, the High Commission for Planning gave the legal population of Marrakesh as 928,850, which corresponds to the combined population of the municipality of Méchouar-Kasba and the five arrondissements of Annakhil, Gueliz, Marrakech-Médina, Ménara and Sidi Youssef Ben Ali. ^ In the 2014 census, the High Commission for Planning gave the legal population of Salé as 890,403, which corresponds to the combined population of the five arrondissements of Bab Lamrissa, Bettana, Hssaine, Layayda and Tabriquet. ^ In the 2014 census, the High Commission for Planning gave the legal population of Meknes as 632,079, which corresponds to the combined population of the municipalities of Meknes, Al Machouar – Stinia, Toulal and Ouislane. 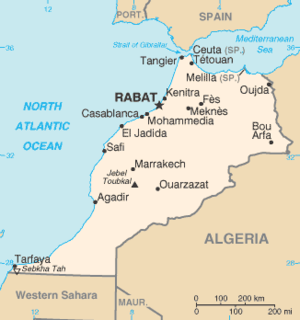 ^ In the 2014 census, the High Commission for Planning gave the legal population of Rabat as 577,827, which corresponds to the population of Rabat Prefecture. ^ The population figure refers only to the urban centre (HCP geographic code [fr] 09.001.05.09.3) of the rural commune of Drargua. ^ "Titre IX. Des régions et des collectivités territoriales". Constitution of Morocco (in French). 1 July 2011. Retrieved 14 October 2017. ^ a b "Répartition géographique de la population d'après les données du Recensement Général de la Population et de l'Habitat de 2014" (in French). High Commission for Planning. Retrieved 14 October 2017. ^ "Resilience and Growth Through Sustained Adjustment: The Moroccan Experience". Occasional Paper 117. IMF: 19. January 1995. ISBN 1557754225. Retrieved 14 October 2017. ^ Démographie Marocaine: tendances passées et perspectives d’avenir (PDF) (in French). High Commission for Planning. 2005. ISBN 9954405283. Retrieved 14 October 2017. ^ a b c d e f g h i "Note de présentation des premiers résultats du Recensement Général de la Population et de l'Habitat 2014" (in French). High Commission for Planning. 20 March 2015. p. 8. Retrieved 9 October 2017. ^ a b c d e f g h "POPULATION LÉGALE DES RÉGIONS, PROVINCES, PRÉFECTURES, MUNICIPALITÉS, ARRONDISSEMENTS ET COMMUNES DU ROYAUME D'APRÈS LES RÉSULTATS DU RGPH 2014" (in Arabic and French). High Commission for Planning. 8 April 2015. Retrieved 29 September 2017.